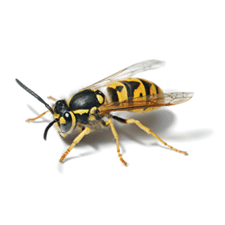 Yellowjackets are small wasps with alternating yellow and black bands on the abdomen. Workers are about ½ inch long, and queens are about ¾ inches long. 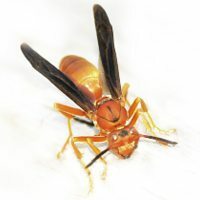 They are usually more aggressive than other wasps and will defend their colony vigorously. Yellowjackets are social wasps and live in colonies that contain workers, queens, and male drones. The colonies only last a year; however, the fertilized queen will overwinter in protected areas like logs, stumps, leaf litter, and manmade structures. Yellowjackets build their nests underground and often in rodent burrows. 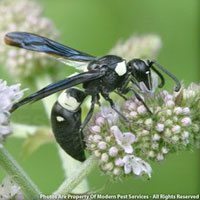 By the end of the summer, a colony can contain thousands of wasps that will aggressively defend their nest. 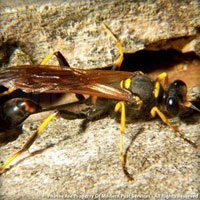 Adult yellowjackets eat a diet high in sugars and carbohydrates. They prefer fruit, nectar, and tree sap. The adults also provide protein to the growing larvae by feeding them insects, meat, and fish that they have chewed and conditioned. The larvae secrete a sugar material that the adults consume. This exchange is a form of trophallaxis. The reason that they are commonly found flying around garbage cans and picnic tables in the late summer is because natural food sources have become scarce and they’ve turned to scavenging. They require extra sugar to sustain the upcoming queens. In late spring and early summer, queens emerge from overwintering and select a nest site. They build a small paper nest and lay their eggs. Once they hatch, the queen feeds the larvae for 18-20 days. After they pupate, the emerge as workers. Workers are small, infertile females that assume the duties of taking care of the larvae. By the middle of summer, adult workers emerge and expand the nest. They forage for food, take care of the queen, and defend the colony. The queen remains inside the nest laying eggs until her death in the fall. The expanding colony can reach up to 5,000 workers by late summer. New reproductives and queens are produced and remain in the nest, fed by workers. Eventually the reproductives leave the colony to mate. 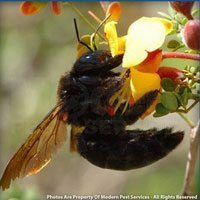 Afterward, the males quickly die, and the fertilized queens find a safe place to overwinter. The original parent colony workers and founding queen leave the nest to die, and the abandoned nest decomposes. 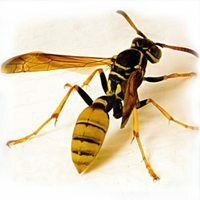 Yellowjacket wasps are the biggest concern to humans from August to October. 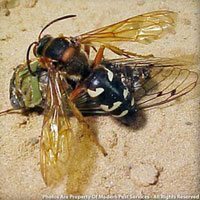 By then, a colony can contain thousands of wasps that will aggressively defend their nest from intruders. Their large populations also scavenge for human food at barbecues, campsites, fairs, and other outdoor activities this time of year. Yellowjackets are easily provoked and can sting multiple times. They will even chase the target for large distances. Yellowjackets are responsible for about half of all human insect stings. Even the vibration from a lawnmower in a yard can incite them to attack.